Yaxley’s FA Vase tie at Erith and Belevdere has been moved back 24 hours to Sunday, January 18. Erith & Belvedere, who are top of the South-East Counties Premier Division, share Welling United’s ground and the Conference side are at home on the day the Vase fourth round tie was originally scheduled to take place. Yaxley will play in the last 32 of the vase for the first time in their 114-year history. 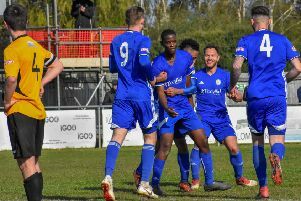 Yaxley boss Brett Whaley said: “I’d much prefer to play on the Saturday as it would be a better day out with coach travel and a night out after the game, but it is what it is and we will look forward to the game anyway. New signing Lee Clarke spent five years playing for Welling, but he’s not certain to be with Yaxley when they travel to Kent. Clarke still harbours ambitions of playing at a higher standard and Yaxley may well leave him out of their team travelling to Kempston for a United Counties Premier Division match this Saturday (December 13). Yaxley’s scheduled Hinchingbrooke Cup tie against Saffron Walden at In2itive Park tonight (December 9) has been postponed as the visitors failed to raise a side. Yaxley are hosting Peterborough Premier Division leaders Coates Athletic in a friendly instead (7.45pm kick-off). Wisbech are in United Counties Premier Division action this evening. They are at Eynesbury and a win would move them up from seventh to fifth. Huntingdon host Rothwell Corinthians in the Hinchingbrooke Cup tomorrow (December 10).